The 2015 Ford Mustang is a pretty big deal to the American performance world and with the next generation pony car expected to arrive within the next few months, the folks from Saleen have offered up the first image of their S302 package – with a front end design that is substantially different and exponentially more aggressive than the standard Mustang face. Steve Saleen made a name for himself by racing and modifying Ford Mustangs and although his brand has now reached out to make big performance in the Dodge Challenger and the Chevrolet Camaro, there are few names more closely associated with high performance Mustangs than Saleen. With that in mind, it shouldn’t come as much of a shock that Steve Saleen’s company is the first to show off how they plan to redesign the front end of the 2015 Ford Mustang. Saleen issued both the picture above and the interesting video below to offer up a quick glimpse of what the tuning supergeniuses have in mind for the 2015 Mustang. At first glance, you might not have recognized the car shown above as the 2015 Ford Mustang, as the Saleen S302 package changes pretty much every aspect of the face has been changed with the exception of the headlights. Really, the Saleen package does away with the Ford designed grille completely so anyone who doesn’t like the look of the new Mustang nose might love this. Starting with the hood, Saleen has added a ton of hard angles to the 2015 Mustang. The raised center section of the hood remains, but the S302 hood has much sharper lines that help to accentuate the low profile air intake. As you travel towards the fenders, the accent line of the standard 2015 Mustang hood is also there although, like the middle lines, these outer lines are much sharper. As you get down into the front fascia of the newest Saleen S302, the look of the standard 2015 Ford Mustang really vanishes. The Saleen grille puts the headlights into a long black opening that runs from one headlight to the other. The running pony is gone from the middle and the Saleen logo appears near the driver’s side headlight. A thinner body colored “bumper” section separates this upper grille from the lower portion that is really what takes the 2015 Mustang to a much more aggressive place. Finished in all black, the lower fascia has hard lines and sharp angles with plenty of openings for things like proper engine cooling, brake cooling and probably some significant downforce. The fog lights are gone and the marker lights of the Saleen package are far smaller than they are with the production Mustang. 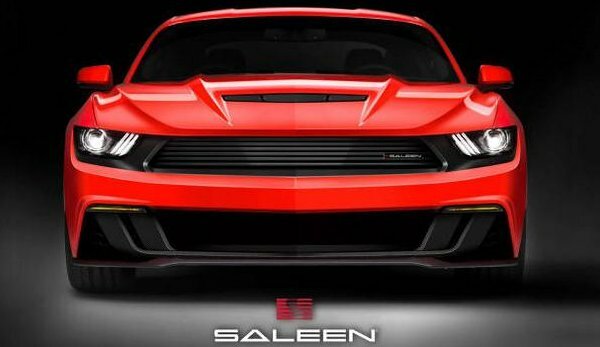 All that Saleen has provided in regard to their take on the 2015 Ford Mustang is a look at the front end so there is no official word as to what to expect in terms of the drivetrain. Fortunately, we can look at the history of the Saleen Mustang to make an educated guess as to what we might see under the hood when the S302 arrives. In the past, the Saleen Mustang “base model” was named the S281 because it had a 281 cubic inch engine with a handful of basic upgrades to make a little more power than the Mustang GT from that same era. Because of that, I would expect that the 2015 Saleen S302 Mustang will be powered by the 2015 5.0L from the Mustang GT with some minor changes that will allow it to make a touch more power than the 2015 Mustang GT. Should this be the case, the S302 would be comparable to the current Saleen Mustang 302 White Label that packs 20 more horsepower than the standard 2014 Mustang GT. Should the 2015 Saleen S302 Mustang prove to be a base model with just a touch more power, I would expect it to be joined by at least one supercharged model that could be called the S302-SC or perhaps the S302 Extreme. I would expect that model to offer similar power upgrades to what we have seen from the current Saleen 302 Yellow Label, with power levels in the 625+ horsepower range. Check out the video below to see the 2015 Ford Mustang GT morph into the new Saleen S302.